Discussion in 'Android Devices' started by mahashel, Dec 22, 2009. Does anyone know of a way to set the phone so that it enters "silent" mode automatically as soon as it's docked? Yes, I know I could silence it a couple different ways *before* docking it, but I frequently forget to do this, which is typically about the time I receive a dozen emails at 3am. Gah! "Silent" mode still allows the alarm clock notification to sound, so it seems like the perfect state for the phone to be in while docked. Have you tried the Locale app? It lets you set profiles for GPS coordinates or (in your case) time of day. You can set it to turn the phone to silent automatically around the time when you usually go to bed, and turn the sound back on when you wake up. Of course, the alarm will still sound. Cool. Not exactly what I was looking for, but I think Locale will work. 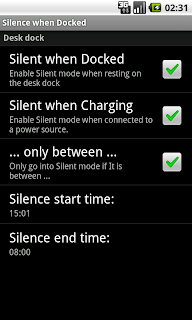 I use Local to set my Droid to silent mode when charging between the hours of 9pm and 6am. Seems to do the trick for me. Maybe Locale will get an update some time to allow detection of being in the home dock or car dock. Locale now has a plugin for the dock that allows you to set up specific settings once you put your droid on the docking station. the plugin is $0.99 which isn't too bad. the crappy part is that now locale is $10 which is pretty insane, and from what i gathered you have to have the paid version to add the docking plugin. Can you provide a link for the plugin?? I use Tasker to set all kinds of thingl based on events or times of day etc. you could set profiles based on being docked, time of day, etc. +1 for Tasker. There's a Docked state that can be used as a context. There is an app called Setting Profiles that has the Dock functionality and all kinds of other stuff. It is one of my must have apps and IMHO beats the socks off of Locale and has a much better price. I tried Locale when looking for a profile changer app and did not find it useful at all. Just bought Silence When Docked. Can't wait to try it out. How is it working for you ? Worked great the first night. 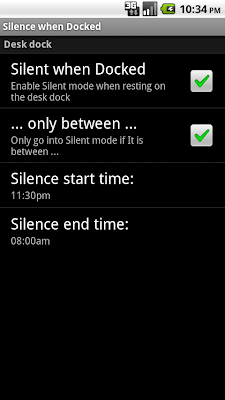 Docked it and the phone automatically went silenced until 8am (which I left as the default "un-silence" time). I'll keep playing with it. Is there anything I can send you to help with this, Linuxwarrior? Does the app output any kind of log file? I'm running Bugless Beast v0.5 (froyo), so I wonder if its more aggressive process manager is killing the app over time. For now, I might try launching & exiting Silence When Docked right before I dock it, just to make sure it's running before I go to bed. Oh, and thanks for writing this app! Sure I can help ! Please follow up with me at my nick at hotmail.com and we'll see that your particular set up works fine. The application does not need to be running in the background, It schedules events with the Android OS to be started when the time is right or the dock/power events occur. I am looking forward to getting the details. I have a similar problem but still somewhat different from others on this same subject. While on the docking station next to my bed and when in Silent Mode everything, including phone calls, are placed in silent mode with the exception of Media and alarms. However, I would like to be able to pick and choose functions I wish to be silent and other functions I wish to be operational. Example: I would like to have emails and SMS in silent mode but still be able to receive phone calls (in case of family emergencies). Is there a way to accomplish this.